Matthews’ Painting Company has been in full service Drywall Repair since they started their painting and drywall business over 20 years ago. We perform drywall repair in the Warsaw, Winona Lake, Leesburg, Syracuse, Goshen, Columbia City, Lake Wawasee, Lake Tippecanoe and North Webster Indiana areas. From patching or repairing the smallest nail hole in your drywall, to replacing whole sections of drywall or re-texturing ceilings, we have the drywall repair experience to meet your drywall needs. Most drywall repairs Matthews’ Painting works on receive 2-3 thin coats of joint compound spread over a larger area than normal. This drywall repair process ensures adequate filling and assists us in having nicely sanded and feathered edges on our drywall repairs compared to having ridges, humps, and uneven repair work. Exclusive to Matthews’ Painting, we can erect temporary plastic walls in areas of the house where the drywall repair work is isolated to a particular room or area when doors are not available to close which helps keep drywall sanding dust to a minimum. In addition, the drywall dust which is generated on interior drywall repair projects is vacuumed up with a filtered vacuum and dust bag. This is a great benefit to your health and over all well being. Holes, dings, dents, etc, are patched and sanded smooth. Nail or Screw Pops are removed if necessary, replaced with new screws 1 inch above or below the area, and repaired accordingly. Stress cracks or bad drywall corners are fiberglass or paper taped first, then repaired accordingly. Water damage and stains on drywall are primed with a stain blocking primer. Textured walls or ceilings are repaired and re-textured to closely match the original drywall texture. Poor drywall repair or texture work that exists from a previous painter or drywall contractor can be repaired to almost new looking again. 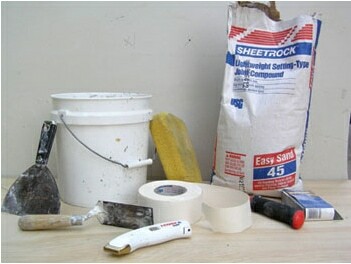 All drywall repairs are primed prior to painting. Contact us or call 574-834-3575 for a free drywall repair or re-texturing quote.